It is now hill climb season, and The Serpentine Road in Rothesay is used for the hill climb of the Bute Cycling festival, held annually by the Bute Wheelers since the 1950s. This weekend is coming up- 17th and 18th September 2011. The festival incorporates a series of four races, with a fun atmosphere that is slightly more informal than some events. It is often used as an end-of-season social trip, with the Saturday night being as important a part of the weekend as the 2-up time trial, the 10, the hill climb or the APR. The climb itself is a steep winding road that spirals upwards for 1/3 of a mile, and like most short, sharp climbs, demands the maximum whether you are racing up it or just riding- taking your time simply prolongs the effort! This entry was posted in Routes / Rides and tagged climbing, Grant Ferguson on September 1, 2011 by Owen. Quick post, while I’m working on some other significant pieces. Edinburgh may be the City of the Seven Hills, but Glasgow also has a few stings in the tail for cyclists riding around the city. The town centre, between Blythswood Square to Buchanan Street has several steep little side streets that must be a killer if you’re riding one of those pedal-taxi things. But tucked away in Partick is Gardner Street, that looks like something out of a Steve McQueen movie. This entry was posted in Routes / Rides and tagged climbing, Glasgow on August 23, 2011 by Owen. 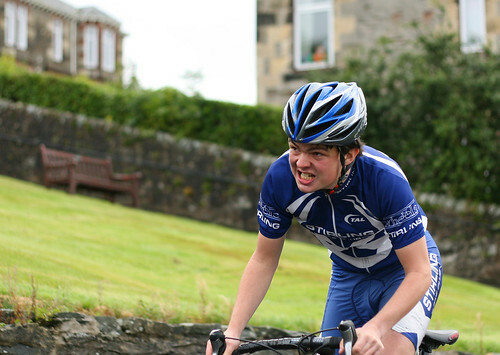 This Sunday is the Sam Robinson Memorial Road Race, promoted by the Glasgow Nightingale CC, is one of the classics of the Scottish calendar. The route skirts around Callander, actually, but the showpiece is the Dukes Pass. Easily accessible from Stirling, and accessible as part of a longish ride from Glasgow, the Dukes is a meaty climb that you can really get your teeth into. This entry was posted in Routes / Rides and tagged climbing on May 14, 2011 by Owen. The Tak Ma Doon road, with its quintessentially Scottish name, is accessible from Glasgow, central Scotland and even Edinburgh, for a longer ride. I assume it was originally a drover’s road – it climbs from Carron Bridge in the North, located in rural Southern Stirlingshire, over the Campsie Hills and down to Kilsyth. The Kilsyth side is a much more challenging climb on a bike however, as you start with less height and the changes of gradient are more testing, so I’ll cover that here. It’s a classic Central Scotland climb but isn’t used in any races or sportives, due to the ford on the other side that crosses the road near to Carron Bridge. It provides access from near Glasgow to a host of other riding in the Carron Valley and towards Stirlingshire, and is ideal when ridden in a loop with the Crow Road. A sign in Kilsyth points the way. This entry was posted in Routes / Rides and tagged climbing, Scotland on March 4, 2011 by Owen. We are near the end of hill climb season and this one is from the brilliant 80s cycling remembered. In 1981, Scottish hill climb champion Sandy Gilchrist (bottom, 2nd from left) raced the National Hill Climb championship, held at Horseshoe Pass. He came 5th in a race that was delayed by snow. Callum Gough was 3rd (see text bottom 2nd from right) – he still races regularly in Scotland and abroad as a vet, and had a good year this year. He won and was on the podium of several races I took part in (in the loosest sense of the word!). This entry was posted in Riders and tagged climbing on October 3, 2010 by Owen. This is not a climb I have done, but one that comes courtesy of several contributions from twitter friends. According to Jim aka @cowspassage, Port Askaig Hill is Islay’s Alpe d’Huez. He explains: it is not a long climb, but is more notable for its Alpine-style road engineering, with a couple of well-graded hairpins. Sounds good to me- one of my favourite climbs in my local vicinity is the Dukes Pass- another road with some nice hairpins. Long overdue a blog post, that one. The image above is from Jez Hastings of Port Mor Wheelers, Wiggle Tandem and Islay Birding fame. This entry was posted in Routes / Rides and tagged climbing, Scotland on September 18, 2010 by Owen. My friend Andrew Abbess was in Edinburgh recently and kindly remembered that I had been charting cobbled climbs in Scotland and snapped a few pics. This little stinger is in Edinburgh’s old town, and the photos were taken where Ramsey Lane becomes Mound Place. The climb is obviously well known to cyclists as shortly after, ERC roadie went past. The climb would be ideal as part of a Tour de France prologue up to Edinburgh Castle. This entry was posted in Routes / Rides and tagged climbing, Edinburgh on September 8, 2010 by Owen. Further to my post about sportive hardman Paul Harradine’s monstrous hill repeats up the Bealach-na-ba, I can report on how his Marmotte went. Photo taken by Paul from Col du Galibier (about 2700m) recce a few days before La Marmotte. Completed La Marmotte on Saturday. 173km over Col du Glandon, Telegraph and Galibier finishing with climb to Alpe d’Huez. Ridiculous temperatures (36C), 5000m of ascent. Still feel like I was beaten with a hammer. Time 7h46min which is probably in top 5% of finishers so pleased. Did 100km today, legs still not working. This entry was posted in Routes / Rides and tagged climbing, France on July 5, 2010 by Owen. Today’s pic is a view of the Bealach-na-Ba, a monster climb in Wester Ross that I have written about several times before. Although the pic is a standard view back down the valley, it is the accompanying text that I think provides more interest (see below). Last minute preparation for the Alps. 5 ascents of Bealach-na-ba. 3 from Applecross, 2 from Tournapress; sea level to 640m each time and max gradient over 20%. Felt good; now having Pizza in Aviemore with the family. Excellent! Once up the Bealach is more than enough for most people but five times in one day, back-to-back is something else. Chapeau to my clubmate Paul Harradine, who is a climbing beast and devours the toughest sportives around (e.g the Dave Lloyd Mega Challenge). He recently did the Dragon Ride on a heavy steel cyclocross bike, after his Lightspeed Ti frame gave out on him. I hope you’ve got something lighter for July! 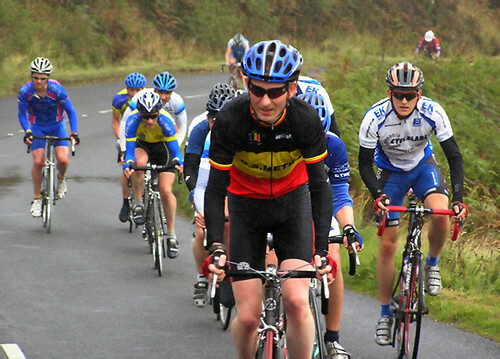 This entry was posted in Routes / Rides and tagged climbing, cyclosportive, Scotland on June 24, 2010 by Owen. Stage 15 of this year’s Tour de France sees a return to the daunting Port de Balês, which was included for the first ever time in 2007. Climbybike describes it as 6.3% average, which doesn’t sound too bad, but 18.87km long and 1200m of ascent puts it in perspective- it’s a biggie. It’s described in detail on the Rapha blog, for the 2007 Etape du Tour. The Port de Balês featured on the first and only Tour de France stage I have seen live, back in 2007, which went from Foix to Loudenvielle, taking in four cols. I wasn’t a big cycling fan then, so it will be good to return and see more racing with a more informed head. I will be heading for the climb, rather than one of the villages in between the cols, where the peloton whizzes past in a flash of colour. Image below was taken in St-Béat, 2007. Rasmussen in yellow days before he got the boot. 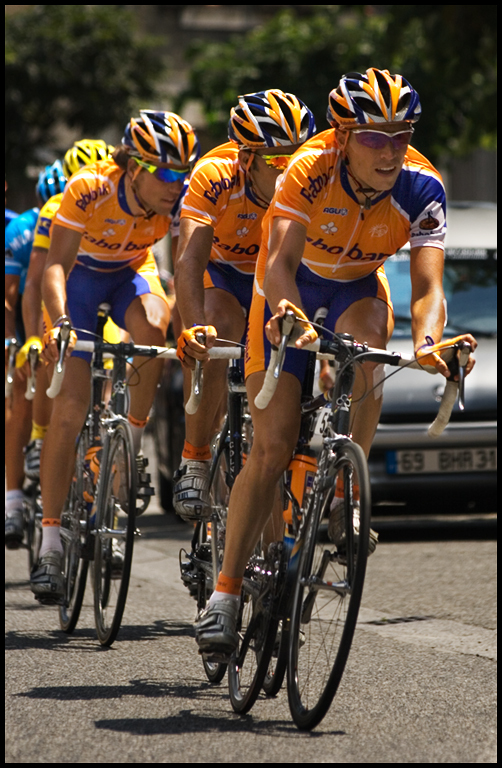 This entry was posted in Routes / Rides and tagged climbing, pro racing, Tour de France on June 23, 2010 by Owen.